A traditional snack, an iconic sandwich and today’s coolest mashup. Three reasons to eat your way in Philadelphia. Philly is an interesting city one of the richest in history around North America. The declaration of independence from the Kingdom of Great Britain was signed here on the 4th July 1776. Those words are still shining: “We hold these truths to be self-evident, that all men are created equal.” The bell calling citizens for the declaration’s first reading is the most well-known symbol of the revolution, and all Americans visiting the city pay tribute to it. 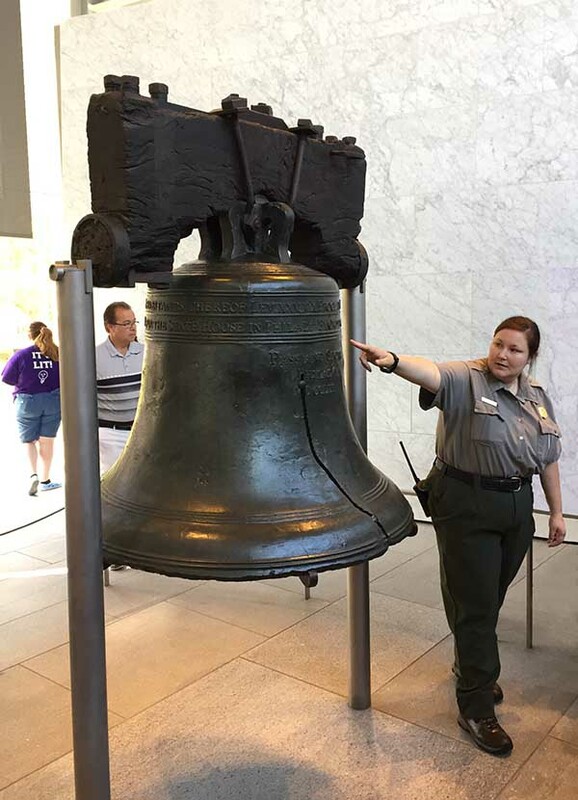 The Liberty Bell over time has been adopted as a symbol by both the abolitionists of slavery and the women’s suffrage supporters. 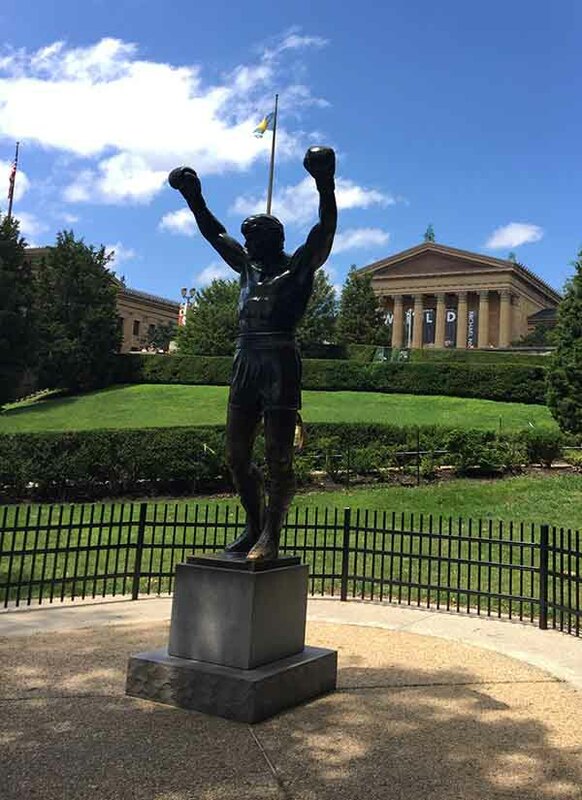 And that’s the hometown of Rocky Balboa, whose bronze statue in shorts and gloves is standing right next to the famous stairway on which thousands of tourists replicate the iconic scene from the first movie (Check!). 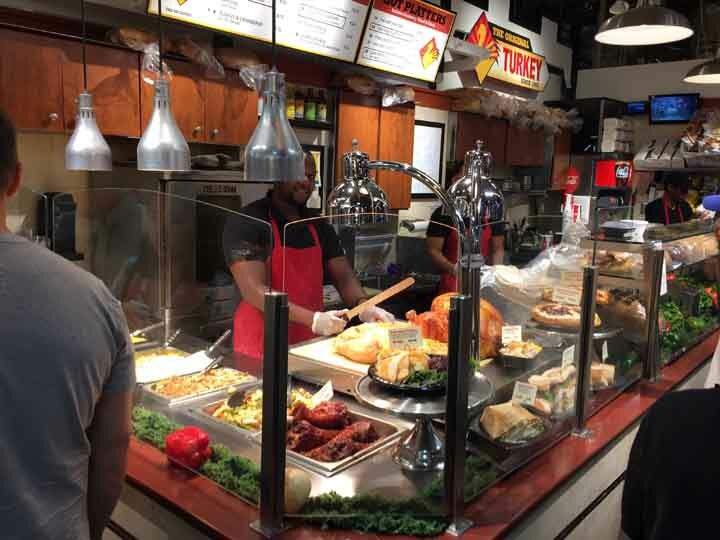 But Philadelphia has a lot to offer in terms of food and I took the opportunity during my 24h stay in town to try a few things I’ve heard about, and I was not disappointed. 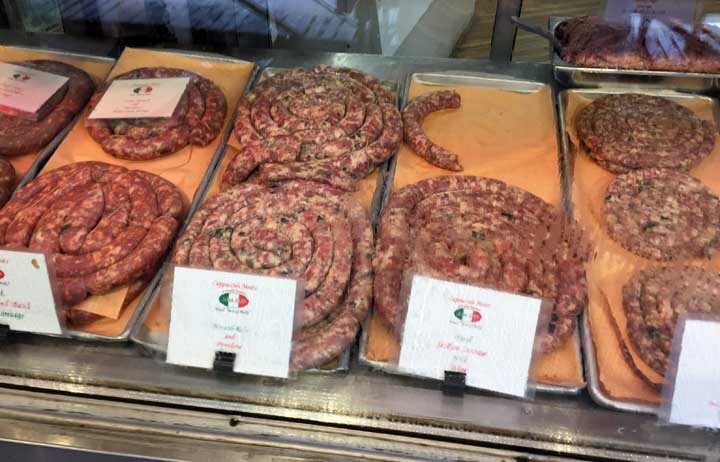 When we talk about food in Philly two places come first to your mind, the historic Italian market and the Reading Terminal market. The first is actually a street (Rocky was running between Italian and American flags and supporters) with shops and barrows selling “Italian” food. A couple of butchers seem more authentic, but for an Italian (actually from Italy I mean) they are not impressive. The Reading Terminal market, on the other hand, is an institution. In this building nearby a railway station you’ll find is a lively food market with tons of options for eating something either on the go or sitting on stools or on small tables between the stands. This formula is quite popular these days (I’ve seen it in at least 6 different countries) but here it has a long tradition. Unfortunately, my visit was super short and I did not have time to try anything (if only I had two stomachs to eat all I want!). No doubt it deserves to spend some hours trying things here, allow some time if you plan to come to Philly. That’s an obvious pick, a must-try in any Philadelphia tourist guide. Well, it is quite unique in American sandwich universe and is always associated with Philadelphia when proposed elsewhere (I saw it in Tennessee and New Jersey for example). It comes as an “Italian” roll bread, stuffed with thinly sliced beef cooked on a griddle, with a cheese of choice among cheez whiz, American and provolone and the option with or without onions. Apparently locals have an obsession on tourists slowing lines because they don’t know how to order. Outside the best known stores huge signs explain what to do and the official tourist site even made a video on that! In fact, just just need to say what cheese you choose and if you want the onions. But there is a sort of code. 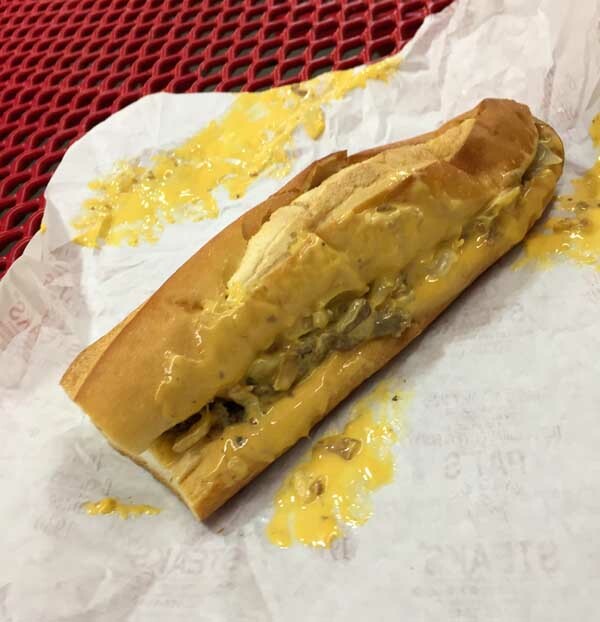 If you want your cheesesteak with cheez Whiz and onions you have to say “whiz wit”. 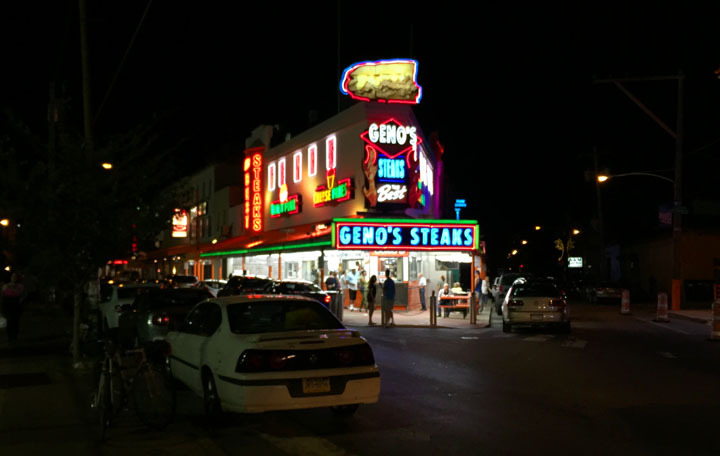 The two historic and most popular cheesestake places are opposite to each other. Pat’s, considered the inventor of this sandwich in the 1930s, inspired by the cuisine of Abruzzo in Italy (coming from Italy I can hardly find anything Italian in it), and Geno’s. We could’t avoid stopping to both places – our accommodation was only 5 minute walk – but EVERYBODY comes here. Check on youtube the videos compare the two sandwiches: you’ll find hundreds! 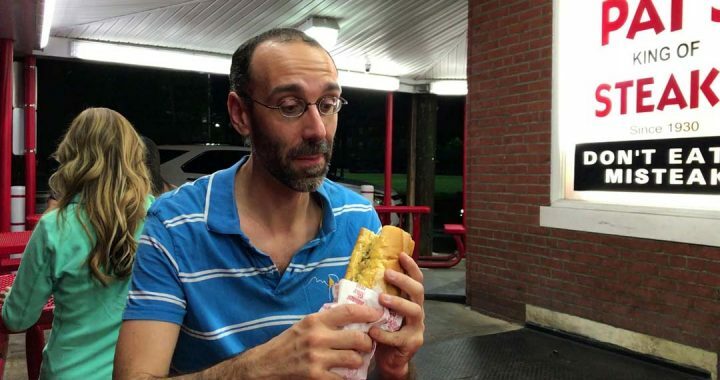 I first tried Pat’s whiz wit. Good size, meat and onions were very good, the liquid cheese was nicely making everything softer (it tasted liked cheddar, with a little fake aftertaste), the bread a bit too wet in my opinion (again quite not “Italian”). I did not feel the need to add sauces (there are ketchup, mustard and peppers on free service). Overall I liked it. I also gave a bite to Geno’s cheesesteak with provolone. It was quite dry due to the cheese (which was tasteless) and the meat was less juicy. I preferred the other one. 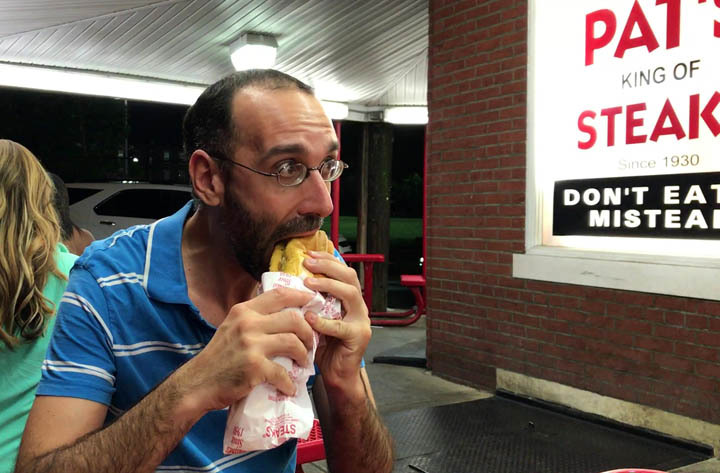 In conclusion, if you have to pick only one go for Pat’s whiz wit. 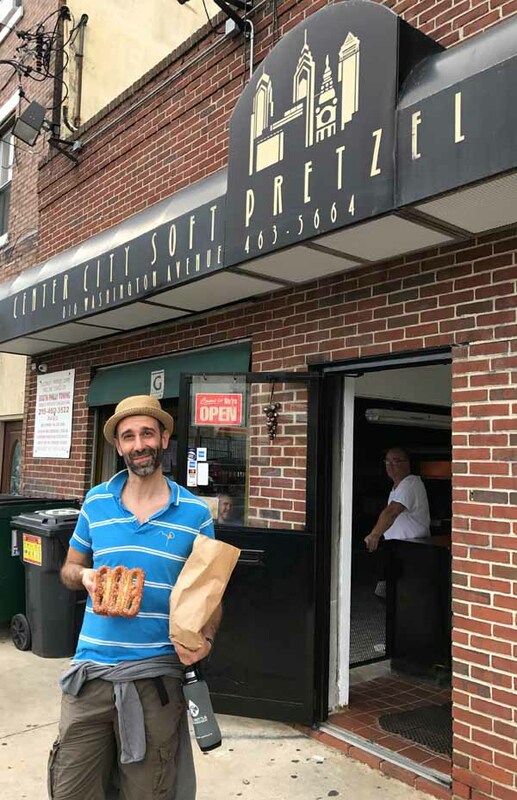 18th century German immigration to Pennsylvania brought bretzels to the new world. Philadelphia in particular has a great reputation for the soft version. Honestly, I’ve never been huge fan of bretzels I had in Europe. But I loved the soft bretzel, eaten fresh from the oven in the city’s most famous bretzel bakery. Actually, the shop looks more like a mechanic workshop than in a bakery. The oven, in fact, does not convey the romantic image of baker craftsmanship and you do not see the product from the small counter. But the smell is amazing. By the time we got our bag of freshly baked bretzels and a small melted cheddar dip I could not stop eating them one after another. The bretzel is quite big, but not too much (smaller than a German one), soft inside and with a golden, tasty, slightly crunchy crust (not a bit gummy like the “classic” version). It is good eaten plain, especially when hot, but is best with the dip. I could make a permanent stock of those at home. Like it or not, mashing up dishes from different cultures is extremely fashionable these days. Usually I’m not attracted by fancy food, but I was quite curious about sushi burrito. So, what is it like? The concept is fairly simple. 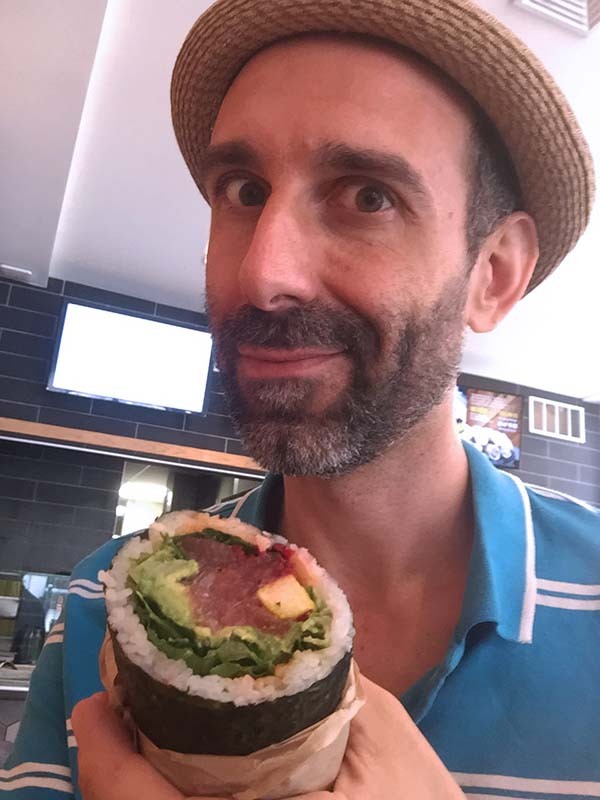 A burrito wrapped in seaweed and rice – like a Japanese maki sushi – instead of the traditional Mexican tortilla. And then full freedom when it comes to the stuffing. Clear, right? Being a new thing everyone does it its own way and there are several places around the US proposing a different interpretation. As far as I understand there are two universe when it comes to the filling, one referring more to traditional burrito (meat and cheese based) and one closer to sushi style (fish based). 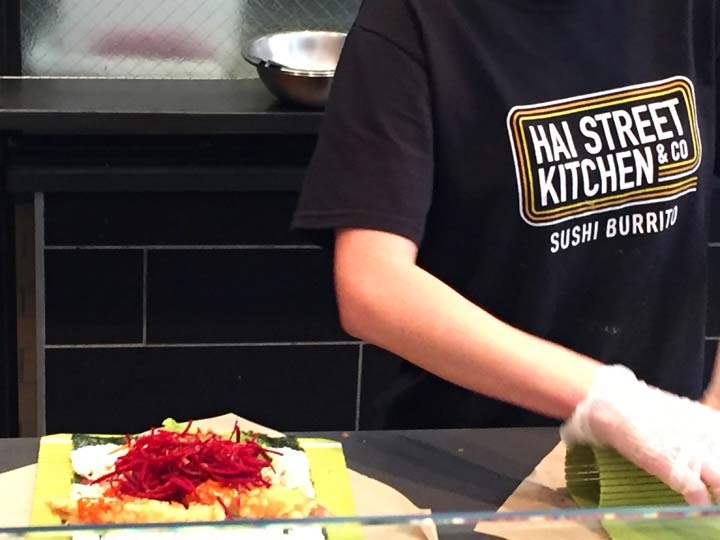 Hai Street Kitchen – which has three locations and a food truck – is the reference in Philadelphia. We visited the store on Chestnut Street. Nice place, few tables and stools. 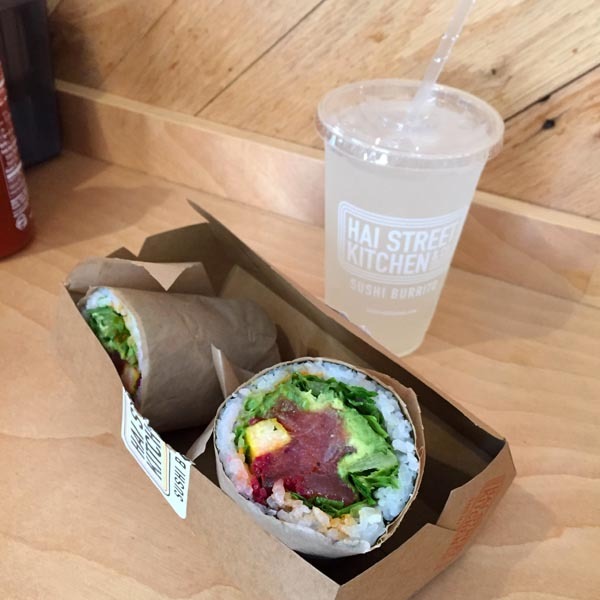 You order sushi burrito at the counter and hey make it for you on the spot (good sign!). The menu includes tuna, shrimp, salmon, crab and chicken recipes. I had Ho-Lee shrimp with avocado. When I saw them making it I though the sushi burrito was huge, but actually the portion is fair right. I fell in love with it at first bite! The tempura shrimp was delicious. The rest of the stuffing (beetroot and asian slaw, a cole slaw version with a touch of Asian spices) makes it way tastier than a classic maki. If I could found it in my town I would eat it every week, which I don’t do with sushi. I also tasted the Flamin ‘tuna. Very good, although I preferred mine. Overall, one the best things I had in the States this time. That’s all about Philadelphia! Check my post about music & food in NASHVILLE! What are your favorite US foods? Have you been to Philadelphia? Leave a comment! 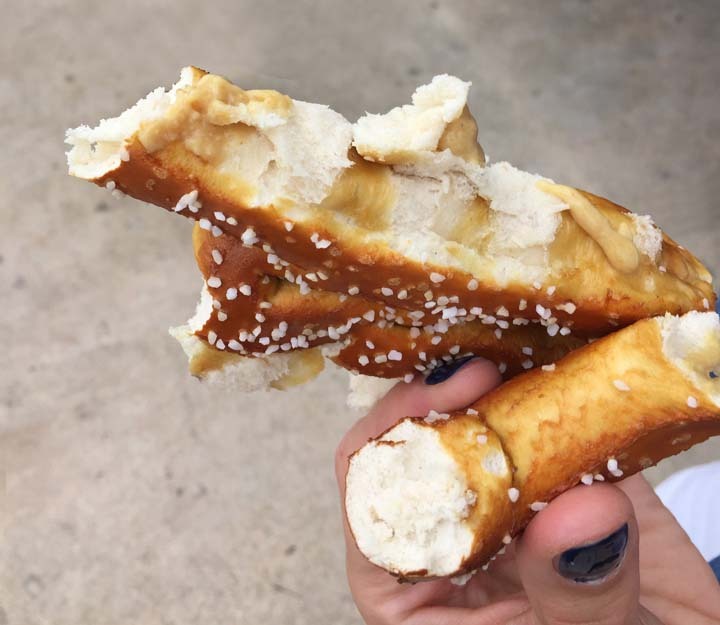 Posted in Travel and tagged bretzel, philadelphia, sandwich, street food, sushi, usa.